Simon Moore, Paul Snook, Patrick Gallagher, Gari Tarn, Myles Benedict and Kent B. Bass formed Drum Theatre in 1985. They released one album, entitled 'Everyman', after which they disbanded. Four singles were taken from the album. 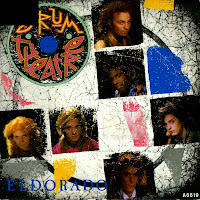 The most successful was 'Eldorado', released in January 1987. It reached number 44 in the UK singles chart and number 13 in the Dutch Top 40. It was their third of four singles.